The 610 Loop Vehicle Detector is an intelligent, extremely flexible and very affordable product. The 610 is designed to accommodate numerous applications and intelligently adjust to environmental conditions, virtually eliminating false detection. It is intended to be connected to a 3- to 5-turn preformed loop such as our Model 865 or a saw-cut loop such as our Model 867. Fact Sheet: All About the 610 Loop Vehicle Detector. Three LED indicators (Power, Signal, Loop Fault). Four programmable signal delays on arrival. Four programmable signal delays on departure. Delay times of 0, 1, 2 or 4 seconds. 9-20VDC or 9-16VAC power requirement. Power requirements: The 610 Loop Vehicle Detector can be powered by either a 9-20VDC or 9-16VAC. The 610 is shipped with a Underwriters Laboratories-approved Class 2 plug-in-the-wall 12 VDC power adapter. However, the power can be supplied by any external device and connected via the screw terminals provided inside the enclosure. Enclosure: The housing is constructed of durable black ABS plastic. Legend art is printed on the cover to clearly identify the connection points and the LEDs. The case provides two mounting tabs for use with the provided hardware. Pulse on arrival and departure. Environmental tuning: The 610 is operational within three seconds of applied power. As environmental conditions slowly affect the loop frequency, the 610 detector follows the change, recording the change every half-second. However, vehicle presence is never tuned out. Hold time is infinite on the detection of a vehicle. If a large metal mass were to affect the loop and create a detection, the next vehicle would correct the presence signal when it departs. In essence, the detector is self-correcting. Signal delay on arrival: One of four delay periods can be programmed. The programmed time delay is the length of time from the detection of a vehicle to the actual output of the signal. Solid state switch signal output: Open collector NPN transistor output. Protected from over-voltage by a shunt 1N5258B 36-volt zener diode. Presence signal is capable of sinking 50 milliamps. Signal delay on departure: One of four delay periods can be programmed. The programmed time delay is the length of time between the departure of a vehicle to the absence of the output signal. For example, if a one-second delay is selected, then the output signal will drop one second after the vehicle is no longer detected. Loop fault: When a loop fault occurs, the red LED is lit and signal outputs go to a presence state. Loop faults are triggered when the loop frequency falls below 20 kilohertz or rises above 75 kilohertz, indicating a loop open or short, respectively. Relay signal output: The 610 Loop Vehicle Detector supplies a 2-amp form-c contact relay output in addition to the solid-state switch signal output. Grounded loop operation: The loop isolation transformer allows operation with loops grounded at a single point. Lightning protection: The loop input is protected by a series pair of 1N5235B 6.8-volt in-series shunt placed the loop input terminal. Internal circuitry isolation: The loop is isolated through the loop isolation transformer. Current draw: Maximum: 25 milliamps. Loop inductance: 30-1,000 microhenries with Q factor of five or greater. Operating temperature: Minus-40 F. to 180 F.
Programmable sensitivity: The sensitivity can be set to one of four possibilities. 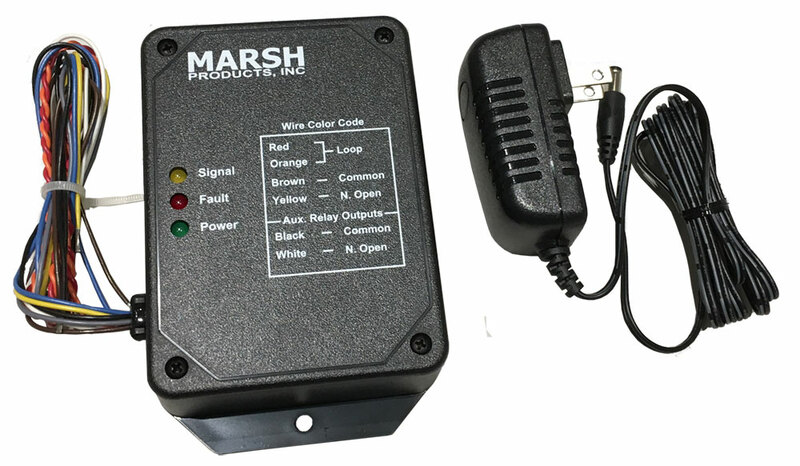 For one year after you purchase a Marsh Products Loop Vehicle Detector, we will repair or replace (at our discretion) any malfunctioning hardware. The purchaser pays only the shipping to return the malfunctioning part to us. The warranty is void if the product is returned in a damaged state for any reason, including damage that occurs because of a failure to follow installation instructions.